The steps below will walk you through activating ITSupportPanel after it has already been installed on your device. Step 2: Once in Applications, find the ITSupportPanel icon and double-click to open it. Step 3: You will immediately receive a prompt to allow ITSupportPanel to Auto Start. Please choose Yes. Step 4: The application will now launch directly to the system tray icon. 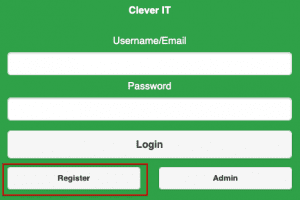 You must now open the application from the tray icon to complete the registration process. Step 5: Once open, paste in the Activation Code provided to you by Clever IT. Then, choose the option to Register and fill in your details. Step 6: You will immediately receive an email with your password to be inputted. You should then see the Clever IT branded support interface.